AFP, 30 July 2017 - A Kurdish Iraqi man armed with an M16 automatic rifle opened fire in a packed nightclub in southern Germany early Sunday after a dispute there, killing a bouncer and wounding four people before being shot by police. The 34-year-old attacker "was critically injured in a shootout with police officers as he left the disco, and later succumbed to his wounds in hospital," police said in a statement. 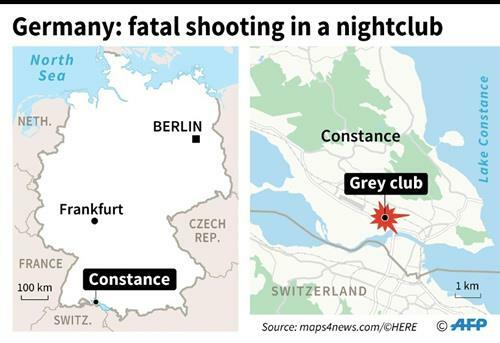 "Nothing suggests that there could have been an Islamist or terror background" to the attack at the club, said prosecutor Johannes-Georg Roth. "Rather, everything points to a personal dispute that had escalated in an unspeakable manner," he added. The foreign gunman had been living in Germany since 1991, having obtained asylum status. He was the son-in-law of the owner of the nightclub called "Grey", and was known to police for previous violations including grievous bodily harm. Investigators piecing together the assault said the man had initially left the site after a "fight with an employee at the disco" and gone home to pick up the US-made M16 rifle. "He came back and shot dead the bouncer at the entrance area of the disco," recounted Roth, adding that the attacker sprayed the area with bullets. He then engaged in a shootout with police before being shot. One officer injured in the exchange of fire only escaped alive thanks to the titanium helmet he was wearing, added police. Officials saluted the bravery of the officers, saying their actions likely saved more lives as the "many magazines were found" at the site. Officers began receiving emergency calls from terrified clubbers at around 4:30 am (0230 GMT) as the man began shooting in the nightclub heaving with "several hundred" people, said police. An unnamed clubber was quoted by Suedkurier daily that he was in the washroom when someone came in and closed the toilet door saying there was shooting. "I didn't believe it and went out. But I heard shots and quickly ran back to the toilet and closed the door with another person. With us was a bouncer who was shot and he was bandaging the wound with a belt," said the witness. A bartender then opened the emergency exit door, allowing revellers to flee, he said, adding that he saw another person with a wound in the leg lying on the grass by the parking lot. "I just shouted at everyone to run and when we were in the parking lot, we heard shots again," he said. The shooting in Constance, which borders Switzerland, came just two days after Germany was shaken by a knife attack in the northern port city of Hamburg. Among the deadliest in recent years is a Munich shopping mall rampage last June by 18-year-old German-Iranian man which left 10 people dead including the gunman himself.